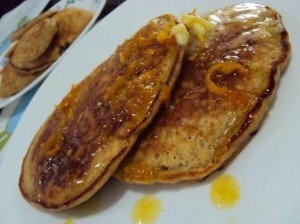 Hearty whole wheat oatmeal banana pancakes, with melting butter oozing down the sides, topped with yummy homemade orange syrup. Great way to start the day! Last Sunday, I took my time getting out of bed despite the fact that I had to prepare breakfast before a jam-packed, run-around-like-a-headless-chicken kind of day. I knew that I had a box of instant pancake mix in my pantry. Or at least I thought I did. My leisurely pace quickly turned frenetic when I discovered that instead of the Pillsbury One Step Hotcake Mix that I usually get, I had inadvertently picked up a box of Pillsbury One Step Leche Flan Mix (how was I to know that there’s such a thing as instant leche flan?). I found this recipe for whole wheat oatmeal banana pancakes online, but I didn’t have all the ingredients on hand, and if I did, I didn’t want to do the extra steps (grinding the rolled oats into a coarse flour, for one), and it was way too much for what I needed. So I tweaked it a little and came up with this. Butter, for cooking, more for serving. Mix all the dry ingredients in a large bowl—oatmeal, flours, sugar (if any), baking powder, baking soda, salt and wheat germ. In another bowl, whisk together the egg, milk, oil, vanilla and honey (if using). Stir in the mashed bananas. Pour the egg mixture into the flour mixture. Mix until moistened. Do not over-mix. Expect the batter to be lumpy and liquidy (but not watery). Let it rest for 5 minutes or so, while you prepare the pan. Melt butter in a non-stick pan over medium heat. Ladle in some of the batter—some recommend ¼ cup at a time, but I add more to make monster pancakes for me and The Hubby, and much less to make mini pancakes for Raine. Sometimes, I get creative and use metal cookie molds in the pan (the no-melt kind) and pour the batter into it; or I try to make different patterns—let your imagination rip! When bubbles form on the surface, flip the pancakes over and cook for another minute or so. This makes about 6 large pancakes, or 2 large ones, 2 medium sized ones (for snacks) and 4 tiny ones (for Raine). Serve hot, so butter will melt beautifully on them (the amount of butter I put negates the healthiness of the pancakes I think!). You can also serve with syrup (I use homemade orange syrup—will post the recipe next time), jam or honey. Raine eats them plain. Note: these are heavy pancakes with some texture, not your usually light and fluffy pancakes. Oh, and one lesson I learned while making these: prayers work to make pancakes yummy! After I had tossed in ingredients willy-nilly, I tasted the batter—and it was awful! But by then it was too late to tweak it (since I could hear The Hubby and Raine getting up), and I had no other ingredients to make a new batch. So Plan B was to drown ‘em pancakes in syrup. As I flipped the pancakes though, I was praying that somehow God would reach down from the high heavens and smite whatever was making the pancakes taste less than delish. And somehow, it did taste better—even without syrup! The Hubby, my toughest critic, gave his approval, and Raine ate them without fuss. Now that’s a yummy miracle right there.